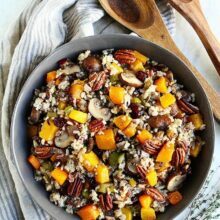 Wild Rice Stuffing with butternut squash, mushrooms, dried cranberries, herbs, and pecans is a delicious gluten-free stuffing that is perfect for thanksgiving, Christmas, or any day! 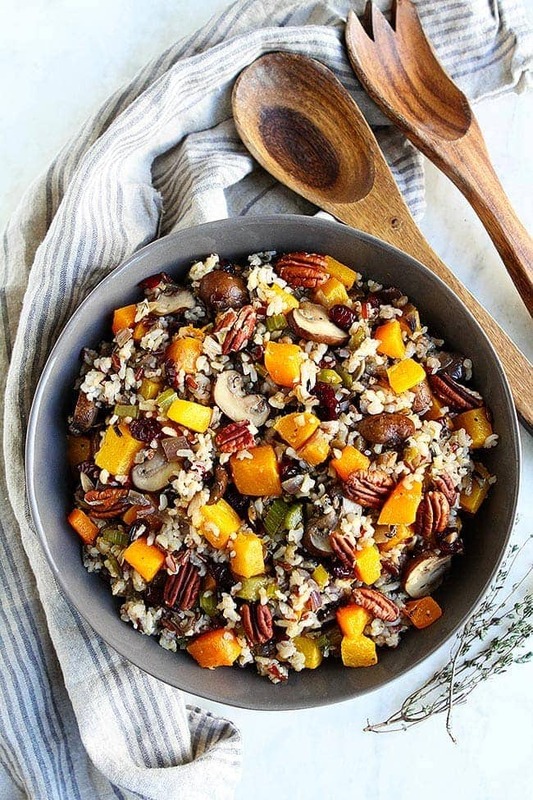 If you are looking for a stuffing recipe that is healthy AND delicious for Thanksgiving and Christmas, you have to try my Wild Rice Stuffing this year. This easy stuffing recipe is gluten-free, vegan, and vegetarian…and it is a crowd pleaser! Sure, the traditional bread stuffing is great, but I like to have options at our holiday table so there is something for everyone. 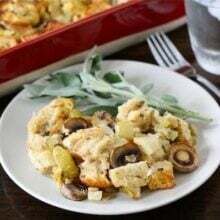 Everyone can enjoy this gluten-free stuffing and they always do! It gets rave reviews every time I serve it. For this rice stuffing recipe, I like to use a wild rice blend, which you can find at just about any grocery store. 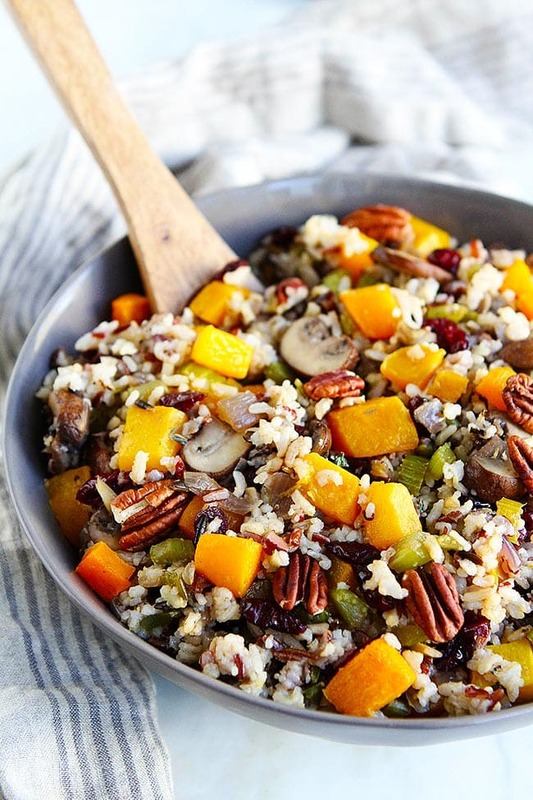 If you can’t find a blend, you can use regular wild rice, brown rice, quinoa, or farro. Basically, any grain will work in this recipe. The cooking times will vary so make sure you read the package instructions. Always rinse your rice before to remove any debris and the surface starch. Rinsing rice will prevent it from clumping up after it is cooked. You can cook the rice on the stove top or in the Instant Pot. I like to cook the rice in vegetable broth to give it extra flavor. You can also use water to cook the rice. To cook on the stove: Add 1 1/2 cups wild rice blend, 2 1/4 cups vegetable broth (or water), and a pinch of salt to a medium saucepan then bring to a boil. Place a lid on top of the pan and turn the heat down to low. Simmer for 40-45 minutes or until rice is al dente. Remove the pan from the heat and let sit for 5 minutes with the lid on. Remove the lid and fluff the rice with a fork. To cook in the Instant Pot: Add 1 1/2 cups wild rice blend, 1 1/2 cups vegetable broth, 1 teaspoon olive oil, and a pinch of salt to the Instant Pot. Place the lid on the Instant Pot and turn until it locks, making sure to seal the vent. Set to manual high pressure and cook for 15 minutes. When the Instant Pot beeps, natural pressure release for 10 minutes and then carefully vent the remaining steam. Open the lid and fluff the rice with a fork. While the rice is cooking, roast the butternut squash in the oven until tender. Roasting the squash gives it a ton of flavor and it’s super easy too! Pro tip-you can buy butternut squash that is already peeled and chopped to save you time. In a large skillet, sauté the onion, celery, garlic, and mushrooms together. I like to add a splash of vegetable broth to season the vegetables. Next, add the herbs. 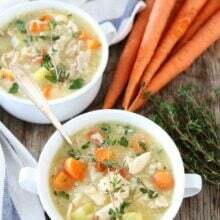 I like to use a little thyme and sage because both play well together and taste like Thanksgiving:) You can also use fresh parsley or rosemary if you wish. When the rice is done cooking, place it in large bowl. Add the roasted butternut squash, the cooked vegetables, dried cranberries, and pecans. Stir until well combined and serve. You can make the stuffing in advance and reheat it. It will keep in the refrigerator for up to 3 days, just don’t add the pecans until ready to serve because they will get a little soggy if stirred in too early. I love this stuffing recipe because it is loaded with the best fall and holiday flavors. It is colorful, healthy, and so delicious. And I always get requests for more Thanksgiving and Christmas recipes that are vegetarian, vegan, and gluten-free, and this one is ALL three! It is an all-around winner! Give me a bowl of this stuffing at Thanksgiving and that is all I need…ok, maybe some pumpkin pie too:) I hope you will add it to your holiday table this year! 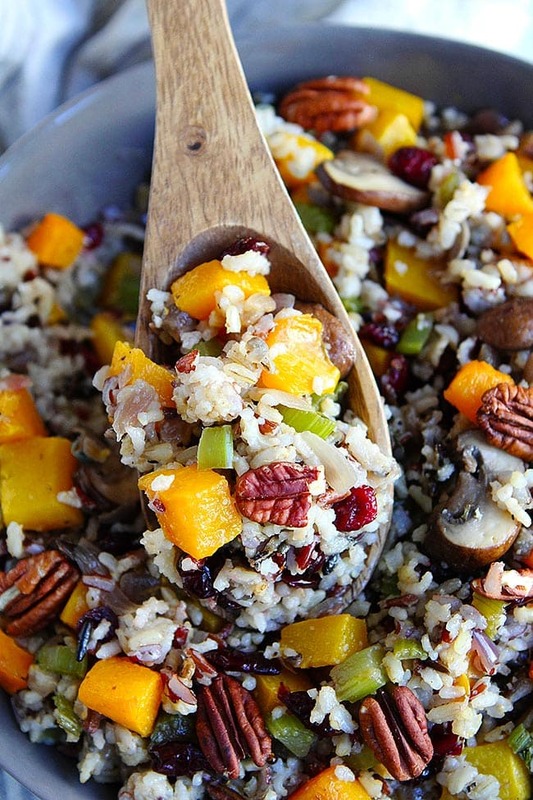 This gluten-free wild rice stuffing is the perfect side dish for your holiday meal. First, cook the rice. 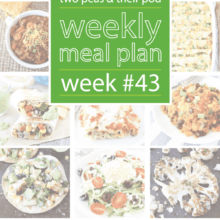 You can cook it on the stove or in an Instant Pot. Meanwhile, roast the butternut squash. Preheat the oven to 400 degrees F. Place the butternut squash a large baking sheet and drizzle with olive oil. Season with salt and pepper, to taste. Roast for 25 to 30 minutes, or until tender, turning once. In a large skillet, heat the remaining olive oil over medium high heat. Add the onion and celery and sauté for 3 to 5 minutes, or until tender. 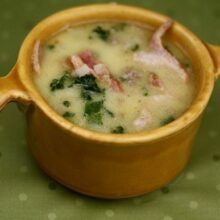 Add the mushrooms, garlic, herbs and the remaining 2 tablespoons broth and cook until vegetables are softened. When the rice is done cooking, pour the rice in a large bowl. Add the roasted butternut squash, mushroom mixture, dried cranberries, and pecans. Season with salt and pepper, to taste. Serve. I’m not a fan of traditional stuffing and this looks like something that I would absolutely love! I just started a blog if you’d like to check it out!